Bushwacker smooth bed rail caps for trucks offer an excellent combination of solid protection and amazing aesthetic appeal for your bed rails. With their high strength Dura-Flex 2000 TPO construction and slick black finish, they are assured to give your truck the defense it needs against nicks and dents, and look good while they're at it. With Bushwacker bed rail caps, you have three great styles to choose from. These caps are sure to add incredible style and protection against damage and blemishes to your bed rails. You also have the option of having them shipped either with or without stake hole cut outs. Since they're UV resistant, they won't fade over time, and will continue to help keep your truck in top shape for years. 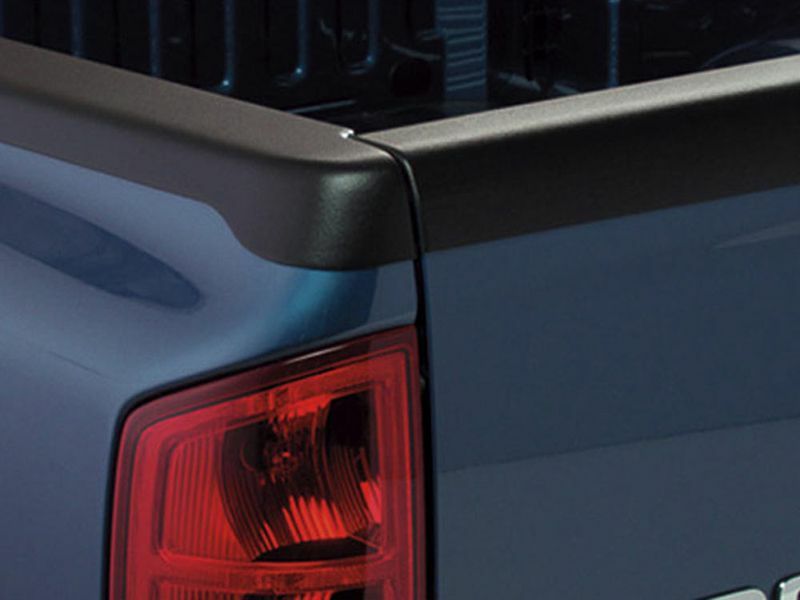 Each pair of Bushwacker smooth bed rail caps is custom fit to the specific make and model of your truck, so you know you'll get a great fit for your vehicle. They are easy to install without needing to drill into your truck, and all necessary mounting materials are included. Once they're on, you'll wonder how you ever got by without them. You can feel good about ordering your Bushwacker bed rail caps knowing that they're American made and backed by a lifetime manufacturer's warranty. Order yours with free shipping from RealTruck.com today! Bushwacker, Inc. warrants its products with a Limited Lifetime Warranty to the original consumer against any defects resulting from workmanship or materials. This warranty applies when the product is used under normal conditions for the purpose for which the product is designed, and does not apply to normal wear and tear or damage related to modification/alteration, accident, misuse, improper care or repair, negligence, or the installation of additional attachments. This warranty is in lieu of all other express or implied warranties including implied warranties of fitness for a particular purpose and merchantability. In no event shall Bushwacker be liable for direct, indirect, or incidental or consequential damages arising out of the use of the product. Some states do not allow the exclusion or limitation of incidental or consequential damages or how long an implied warranty lasts, so the above limitation or exclusion may not apply to you. This warranty gives you specific legal rights and you may also have other rights which vary from state to state. Install your new Bushwacker rail caps at home without any cutting or drilling needed. If you have any questions or want to chat, give us a call. We have representatives here 7 days a week for your covenience.